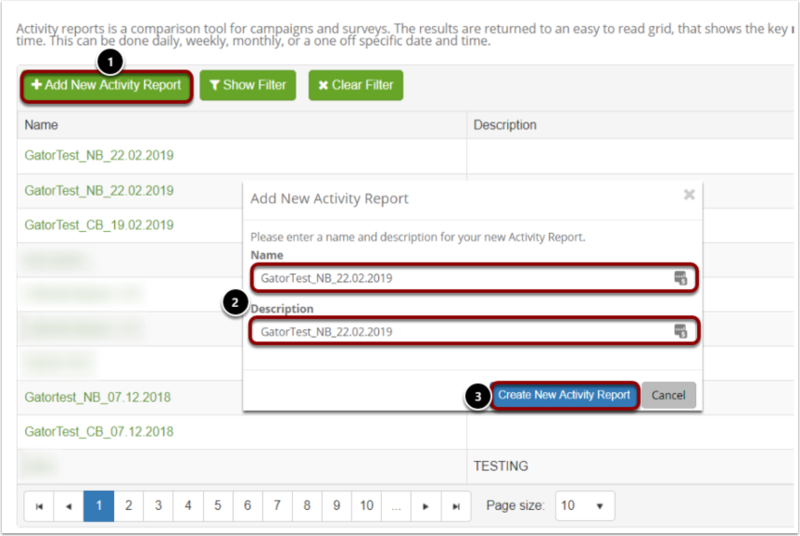 Activity Reports allows you to run a report based on multiple campaign options, survey, and events. An integral feature of Activity Reports are our Scheduled Notifications. 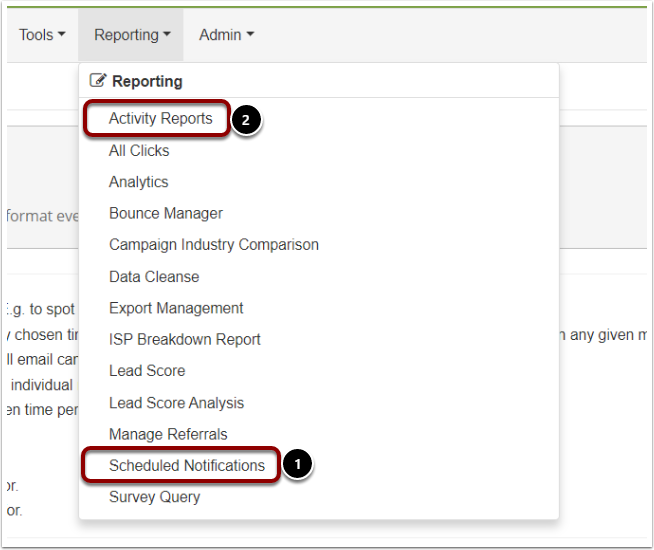 Once the report is created you can create a scheduled notification to email out the report to chosen recipients at a set time and frequency. Click on 'Add New Activity Report'. Enter the name of the report and a brief description for what it covers. Click on 'Create New Activity Report'. 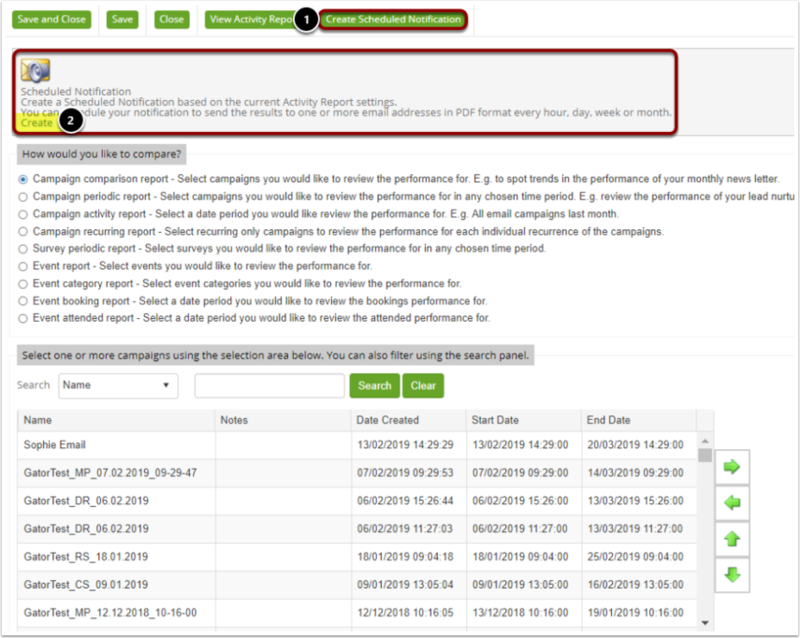 Campaign recurring report - manually select recurring only campaigns to show a breakdown of each individual period stats. Survey periodic reporting - manually select the surveys that you would like to review the performance of in any chosen time period. Event Report - select events you would like to review the performance for. Event category report - select event categories you would like to review the bookings performance for. Event attended report - select a date period you would like yo review the attended performance for. 2. You can search for a campaign to run a report on using the search filter above. 3. Once you have decided what campaign/s to run the report on, select it and use the green arrow icon to move it into the right hand side box. 4. Select 'View Activity Report' this will bring up a new screen. Click on 'Start Report', this will begin to process the campaigns and the data. The page will refresh and the current status will show that the data is being processed. Once complete the status will return to idle. You will need to click on 'Refresh Results' for the stats to show in the grid below. This is where you will see all your stats for the report. You can click on this option to export the results to Excel. Clicking on the name of the campaign will take you to the campaign results tab. Click on the magnifying glass icon to bring up a preview of the email attached to the campaign. Please Note: Each time you view the report you will need to click on 'Refresh Results' to view the stats on demand. 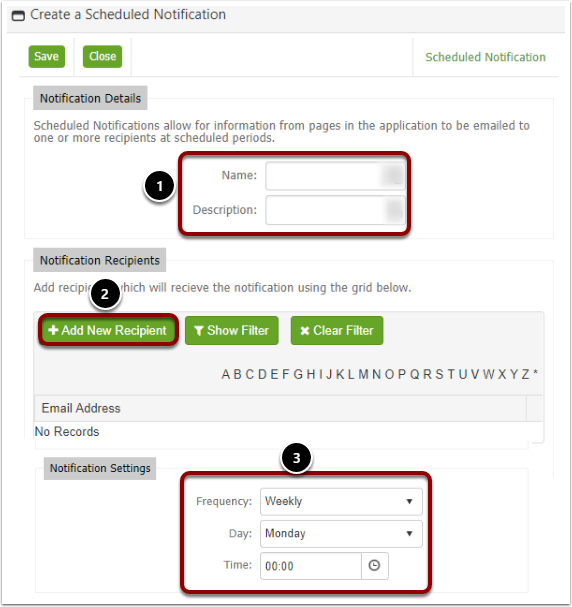 Once the activity report is created you can the create an automatic scheduled notification. Open the Activity Report, and click on 'Create Scheduled Notification'. This small window will appear and you will then need to click 'Create'. A pop-up window will appear for you to setup the notification. Enter in the report name and a description. Select 'Add New Recipient' to add recipients to the report. Once you have set up the notification click Save, then click 'Save & Close' on the Activity Report. 1. Go to the Reporting Tab and select Scheduled Notifications. 2. Go to the Reporting Tab and select Activity Reports. The icon shown in the screenshot above indicates that you have a scheduled notification set on an Activity Report. Clicking on this icon will bring up the notification details screen. 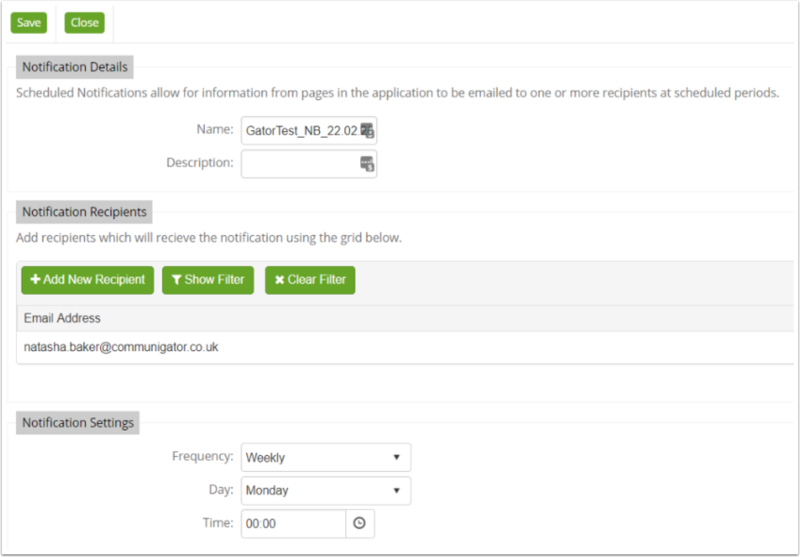 This is where you can also edit the details if you need to add more recipients or change the timings. Here you can see all of your set up scheduled notifications. Clicking in to the name of the notification will enable you to edit its details as shown in the Activity Report.